While paper training a puppy is not for everyone, there are times when paper training may be the best choice for a dog owner. The choice of whether you paper train or house train your dog will depend on the size of your dog and your lifestyle. Before you make a final decision on this, consider the pros and cons of puppy paper training. And think about how you want to handle potty needs when your dog is older. A new puppy is such fun! But there are choices to make. One important choice is whether you will paper train or housebreak your new dog. Who Should Consider Paper Training? If you have a full time job, and no one is at home during the day, it may be very difficult to house train your dog. Little puppies do not have very good bladder control, and they will need to be taken outdoors frequently to prevent accidents in the house. If you are not home when your puppy needs to go out, you are setting him up for failure. If you will be away all day, it is too confining to leave your puppy or dog in a crate for the entire time. Two or three hours at a time is the limit for a little puppy. An older dog can tolerate up to 4 hours in his crate at a time. A better choice is to confine your pup to a small room with a washable floor. Use partitions so that part of the kitchen is a play area and part is your puppy paper training area. I’ll discuss how to make the paper training area work, in a section below. If you work close to home, you should consider going home at lunchtime to feed your puppy, walk her and spend a little time with her. This will help her get through a long lonely day without you. Another example where paper training could be appropriate is for people who live in the city or in apartments. If the puppy’s owner is unable to take the puppy outdoors because of weather or because the owner is disabled or injured, paper training could make sense. Additionally, some people actually train toy or miniature breed dogs to use a litter box, like a cat would do. A third situation where paper training could make sense is for a rescue dog that is not house trained. Whether the dog is regressing because of the stress of being in a new home, or he simply never learned to potty outdoors, you may consider paper training. When you paper train an older dog you will need to have extra patience. On the other hand, switching from paper training to housebreaking for a mature dog, is difficult for both you and your dog. This can be especially trying for owners of recently rescued dogs. Paper training is most appropriate for small male dogs or small to medium female dogs. Larger dogs will create too much urine, and they do need exercise outdoors, as well. Dogs are quite content lying or sitting in grass. They also find it natural to pee and poop in grass. Paper training and house training are two very different things. When you paper train a dog, you are training that dog to pee and poop in the house. When you house train or housebreak a dog you are training the dog to pee and poop outdoors. You can’t have it both ways. At some point, you’ll have to make a decision. Some people paper train their dogs as puppies, and then house train their dogs later. There is quite a bit of controversy about doing this. When you train your puppy to potty on paper indoors, and then switch the program to get him to potty outdoors, he will be confused. What used to get him praise before, is no longer allowed. What’s a puppy to do? Paper training a puppy does have some disadvantages. For one, there is always some odor. Cleaning it quickly and using the right products will help. But there will probably be some residual odor. Secondly, paper is paper. Puppies that are paper trained may pee or poop on any paper, whether it is on the floor, or not. And, since they can’t read, it does not have to be newspaper. Use your imagination. Any paper lying around may be used as a bathroom. In addition, if you intend to housebreak your dog later, paper training slows down the process of housebreaking your dog and getting him to potty outdoors. Confine your dog to a small room with a washable floor. Often this is the kitchen. For a large room, you’ll need to partition it so your puppy has a smaller space. If you use a pet gate, make sure that the spaces are small, so your puppy won’t crawl through them. 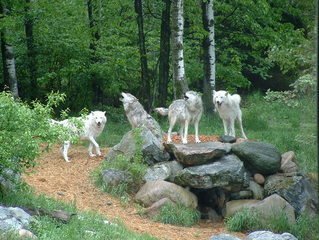 There are several approaches to making a puppy area. Free standing gate – If you choose this kind of gate, make sure that your puppy is not able to jump up on the gate and knock it down! The Richell freestanding pet gate is an example of a gate that is sturdy enough to handle a puppy’s jumping. Adjustable gate for door openings – This kind of gate fits in a door opening. It is not permanent, so you can remove it. Usually it can be adjusted for different door opening sizes. An example of this kind of gate is the North States Supergate Deluxe. Full room width gate – The Regalo Super Wide Adjustable Gate and Play Yard is perfect for paper training. You can actually partition off half a room or you can make a circular play area for your puppy. This limits the area that your puppy can use and will help you with paper training. For small puppies, a folding gate is not appropriate. 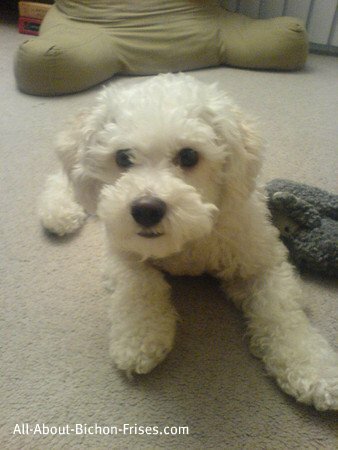 Little Bichon Frises are able to crawl under the bottom and get loose in the house, when you are not home. This is a recipe for disaster! The next step is to line the entire floor area with paper. 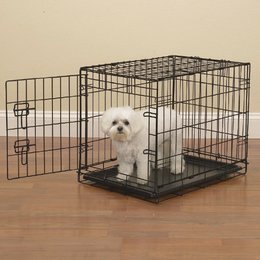 This means all the floor that your puppy is able to access, within his confined area. This is temporary. You won’t have to do this forever. But you do need to make sure that you cover the entire area, for now. This step is key to your success. When it is time for your puppy to relieve himself, you will take him to this paper-covered area. With papers everywhere, he can’t fail. If your dog starts to pee far away from your Target area, gently say, “no”, pick her up and take her to the Target to finish. When she pees in the designated spot, give her lots of praise and a nice treat to show her that you are pleased. You do not need to raise your voice to your dog or hit him, ever. This is a teaching time and your puppy just needs to learn what you want him to do. Next, dispose of the soiled papers. But, you need to keep one sheet with dampness and odor on it. Place this soiled sheet of paper where you want your puppy to end up using as his bathroom. This can be in the corner of a room, by the door or near a sink. Your choice. This is the Target area. Cover the soiled paper with fresh newspaper. 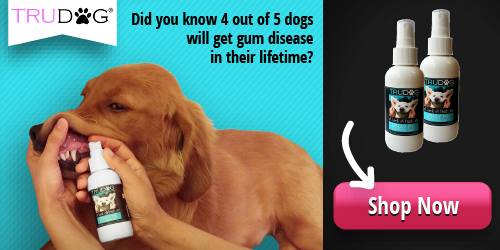 You won’t be able to smell the urine, but your dog will. And the scent will attract your dog. Dogs will pee where they already smell urine. Bingo! Keep placing the soiled paper (topped off with clean papers) in the Target area. Your dog will be attracted to the smell and will “go” in that area. Each time you see your puppy potty in the Target area, praise him. After you see that your puppy is starting to use the papers near his Target, start to take away the papers that are farthest away. Gradually your papered area will get smaller, until you only need a small area of papers. Just don’t make the papered area too small. 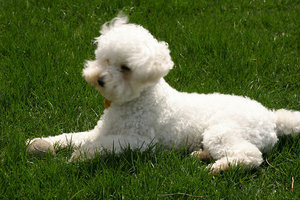 Puppies do not have perfect aim, and your little Bichon may just miss the mark a few times! At some point, your puppy will understand that the Target area is his potty area. He should start to go there on his own. To prevent odors and leakage, you can lay plastic trash bags or plastic sheeting underneath the papers. Of course there will be some leaking or misses that will hit the floor. You will need to wash and sanitize your floor to prevent residual odors and germs. Using a product with enzymes will actually kill the odors, not just mask them. There is nothing more offensive than pet urine that has soaked into a wooden floor. This odor can turn the stomach of even the most ardent dog or cat lover. And the smell of pet urine has discouraged the sale of many a house on the real estate market! Bubba’s Pet Stain and Odor Eliminator – Bubba’s is a commercial strength enzymatic cleaner that can be used on linoleum, carpet and even hardwood floors. It has a number of other uses, as well. If your dog vomits or you need to remove grass stains from clothing, you can use this product for cleanup, as well. Bubba’s removes the odors and the stains. Rocco and Roxie Professional Strength Stain Remover – This product has similar uses as Bubba’s and it uses enzymes, as well. It can also be used for vomit and other messes. Rocco and Roxie comes in a spray bottle for convenience. There are a couple of things that you should not use for cleaning urine. Vinegar smells like pee to your dog, so it’s not a good idea to use vinegar. And ammonia smells just like pee to your dog, because urine actually has ammonia in it. These are both attractants to your dog. There will always be some spots that get overlooked and of course, smelly. So how do you find what you cannot see? There is a way! If you use a black light ultraviolet urine detector, they will show up and then you can clean them. Newspapers are quickly becoming a thing of the past. Some households don’t even subscribe to a newspaper, since it is so easy to get news on the internet. An easy alternative to newspaper is using disposable puppy training pads. Top Dog Deluxe Puppy Pads have a number of nice features. They are dark charcoal in color, because they contain charcoal, a natural deodorizer. Because of the color, they don’t show yellow stains from urine. The pads contain a pheromone, which is a substance that attracts your dog and encourages him to potty on the pad. And when your dog does pee on the pad, it turns to gel, eliminating most of the problem of spill-over onto your floor. After a few potty times, simply take the pad and dispose of it. Quick and easy—like disposable baby diapers! For the economy minded pet parent, there are washable puppy training pads. You can wash the pads up to 300 times before you have to replace them. Whether you are environmentally conscious and want to prevent paper pads from going into the waste management landfill or just want to save money, this could be an alternative for you. Having several washable puppy pads gives you the option of washing less often. Some people hose them down and wash the pads in the washing machine occasionally. There are some real grass pads that seem to work for some dogs. If you choose this method, you will have to replace the grass pad every 2 weeks to a month. You don’t have to water the grass or mow it, and you will have to clean up and dispose of the poop. What about the artificial turf pads? Some people seem to like them, but I did not have a good experience when we tried using one on our boat a few years ago. Our dog Pepper had absolutely no interest in using it. It seems like artificial turf would be easy to clean, but people are reporting that the plastic holds the nasty odors. So, whether you decide to paper train your dog or not, will depend on your lifestyle and how much time you can devote to housebreaking your new dog. 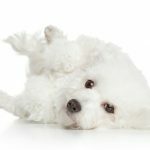 The decision is not so easy as it first appears, and you’ll need to consider how you will handle the potty issue when your dog is no longer little.